The Arizona Termination Lease Letter is the legal notification required when one party wishes to end a lease agreement. 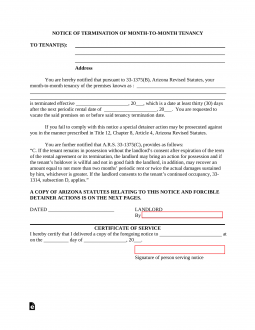 The State of Arizona will recognize that a month-to-month lease agreement can be a somewhat temporary situation however, it makes an attempt to safeguard both landlord and tenant from one another’s actions by requiring proper notice be given before the termination date. This shields a tenant from suddenly finding themselves homeless or perhaps a landlord from suddenly having to substitute the money he or she requires from a tenant in a set budget. Laws – A.R.S 33-1375 – This notice must be served with at least thirty (30) days’ notice by either landlord or tenant. There is no doubt that when one party suddenly breaks such an arrangement the other will usually suffer (in most cases). By providing thirty days’ notice the remaining member of the lease agreement has the time to absorb the change and make preparations so that he or she does not go through undue suffering as a result of the other party’s decision. An added benefit to this is that it’s considered a decent way (in addition to lawful) of ending the agreement. This can leave a positive impression with the remaining party and generally speaking, leaving a good note is a preferable manner to end such an arrangement. Step 1 – Next to the words “To Tenant(s),” at the top of the page enter the tenant’s full name and notice contact address. Step 2 – In the first paragraph, enter the address for the agreement that is being terminated, the termination date, and the date the termination goes into effect (thirty days from the notice date). Step 3 – At the bottom of the page, the Landlord should date the document then sign it. Step 4 – The final section “Certificate of Service” may only be filled out by the person serving this notice. He/she must enter the name of the receiver, the receiver’s address and the date of serving notice. The person serving must sign this.